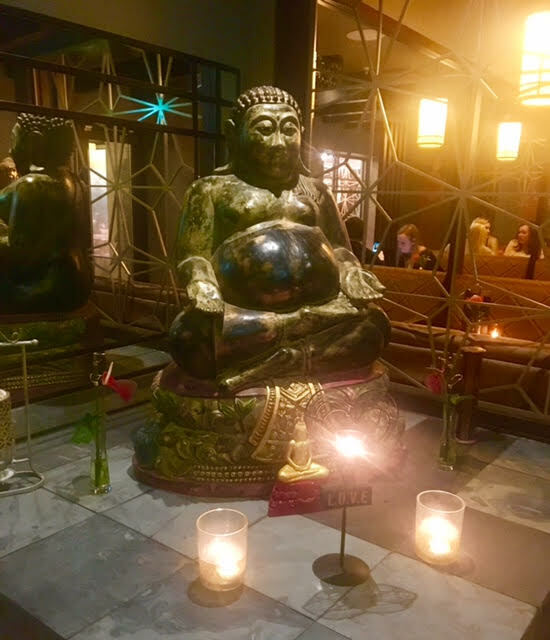 Chaophraya Newcastle Review - The verdict on The Toon's latest Thai spot! 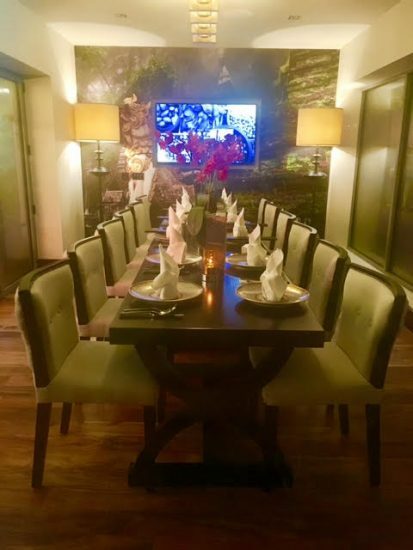 Chaophraya Newcastle Review: The verdict on the Toon’s newest Thai spot! 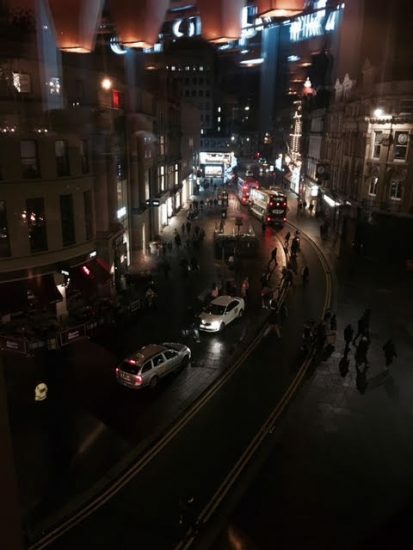 N.B – We visited Chaophraya Newcastle at night, so the pictures aren’t the best quality thanks to ambient lighting. Sorry about that! One of my weaknesses in life is Thai food. I am obsessed. 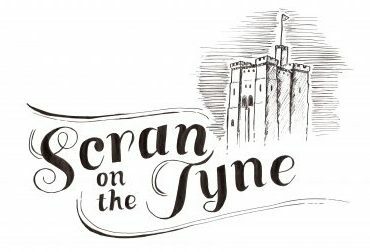 I’m particularly into Mantra Thai, actually, or the Old Siam on the Quayside, but now there’s another Thai eatery to satisfy my penchant for South-East Asian food. Enter Chaophraya Newcastle, situated in Eldon Square’s food quarter (yep, another one!) atop the whole place. If you’ve recently been around Grey’s Monument and looked up, you may well have spotted it. Chaophraya is part of Thai Leisure Group, co-owned by Kim Kaewkraikhot and Martin Stead. Kim was a chef and she ran her own small restaurant in Bangkok. As Stead learned more about Thai cuisine, he spotted an opportunity in the UK market to bring authentic food and Thai hospitality to the mainstream. The Chaophraya journey started in Leeds back in 2004, and today they have 8 restaurants in the UK. They also own Thaikhun, which I recently visited in the Metro Centre. 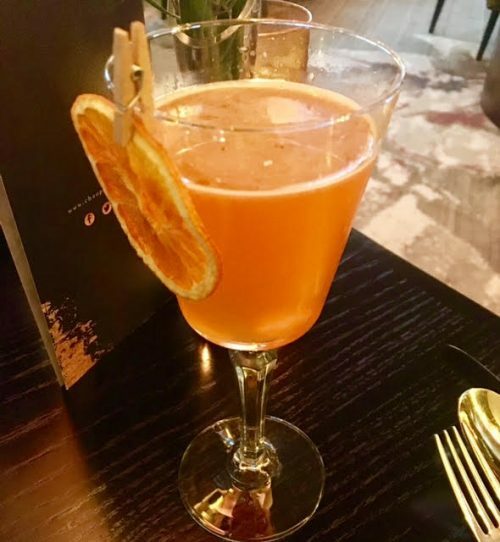 After a kind invitation from from Chaophraya Newcastle’s PR team, we headed there a few weeks back to sample their delights and see what all the fuss is about. The restaurant itself is very easy on the eye indeed, with beautiful and ornate furniture, Buddha statues aplenty and lighting that resembles those lovely lanterns set off across the idyllic islands in the Gulf of Thailand. You may have also seen Leo himself set off a similar lantern on the film, The Beach. Anyway, the lighting was lovely (not so good for photos, mind!) and of course, it’s blessed with plenty of natural light thanks to the floor to ceiling windows around the front of the restaurant. 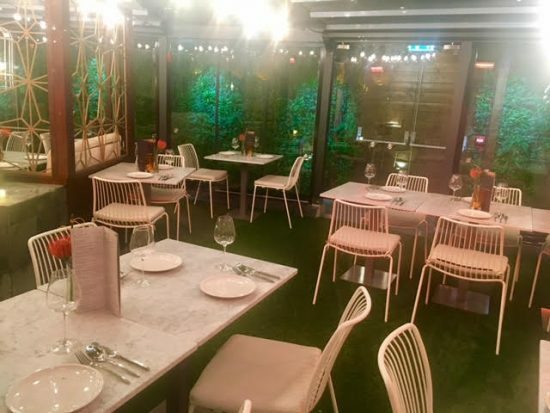 They have a private dining area, an open-air rooftop dining area and a large number of tables, including lovely booths covered in traditional Thai fabrics. There are two entrances, one accessed by the lift at the Grey’s Monument entrance of the food quarter, the other a set of stairs up from the first floor. We took the latter, but left by the lift which is a far more impressive setting. We scored a window seat, sat right at the tip and looking out on to Blackett Street and Grey’s Monument. After being seated we were given some time to peruse the menu and choose drinks, but unfortunately they were experiencing something of a drought in the beers department. As such, my boyfriend had to forego his much anticipated pint of Singha for a bottle of beer, the Lowlander IPA 6% (£5.25). Meanwhile, I opted for a cocktail, The Flower Garden (£9), composed of Aperol, Colonel Fox Gin, St Germain Elderflower,lemon and vanilla. In terms of presentation, I’d expected a little more theatre, but taste-wise it was good and a lovely aperitif! Or at least, it would have been if it had arrived before my starter. Unfortunately, this was not the case and neither drink was out before our dishes arrived. 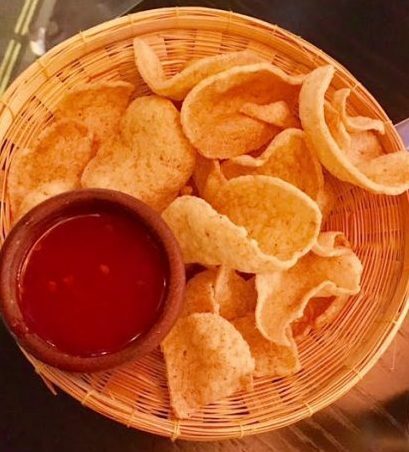 While looking over the menu we were brought out some Thai prawn crackers, served with Thai sweet chilli dipping sauce, which were well… crackers, but really tasty ones. Before visiting Chaophraya Newcastle, I’d done my homework on their menu. I knew what I was going for and had spent most of the day before our arrival just thinking about it. To start, I went for the Soft Shell Crab and Prawn Tempura (£12.50), a generous selection of freshly-fried seafood in a light tempura batter. 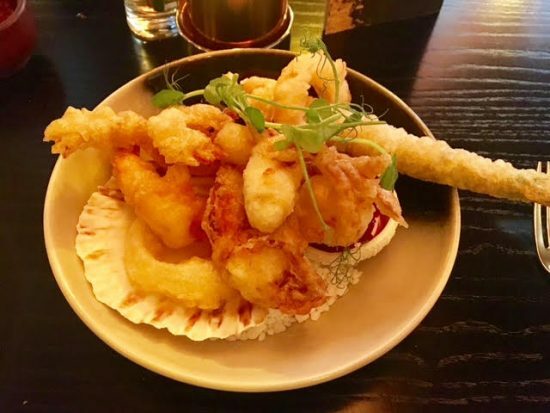 When it arrived, I was delighted that the presentation was quite a step up from Thai-food neighbours Zaap, with all the tempura piled into a shell. There was a rogue bit of tempura asparagus on my plate, and weirdly, tempura onion rings (?!) which were basically just err, onion rings, neither of which I wasn’t a fan of. The seafood would have been enough for me. The tempura prawn and soft-shell crab were absolutely divine, however: well seasoned, crispy, piping hot inside and super fresh. I demolished every morsel and could have probably enjoyed more. The Thai chilli sauce was full of heat and let’s face it, you simply can’t go wrong with tempura seafood and a nice sweet chilli dipping sauce, can you? My boyfriend was pleased to see his favourite, Satay Chicken Skewers, on the menu, so it was a given what he’d be going for. 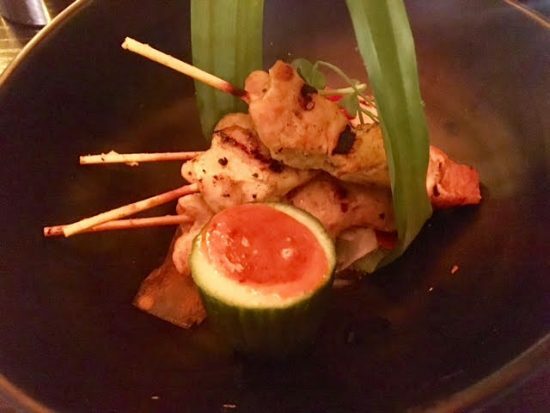 Don’t be fooled, however, these are not Satay Skewers as you’ve seen them before… Served with a banana leaf wrapped in a circle around the dish, the chicken was lightly charred and served with a slightly spicy peanut dip, bursting out of a cucumber, of all things! The only problem with said presentation of the dip was that it wasn’t actually wide enough to fit the skewers in, and it wasn’t too plentiful, either. He had four skewers and walloped the lot off in record time, so I’d say they were a hit. I had a try of the chicken and it was gloriously tender, but the star for me was Chaophraya Newcastle’s home-made peanut sauce. So distinctive. At this point we were done with our first round of drinks and thought, in the interest of being economical, we’d opt for a bottle of wine to share, given the pricing on the cocktails and the lack of draught or bottled beer. We chose a bottle of Chardonnay (£19.50) which was oaky and crisp, and weirdly, complemented the Thai food rather well. Who’da thought?! 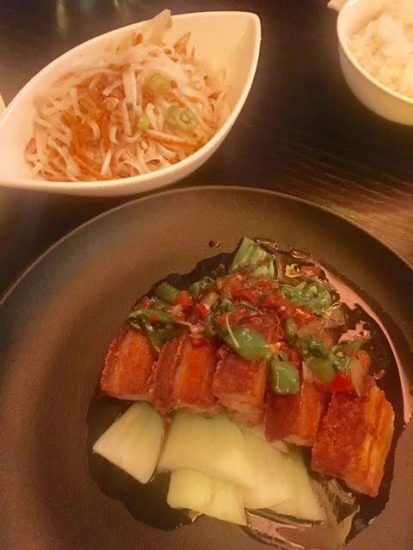 I went for the Crispy Pork Belly served with Thai Basil (£12.50) and a side of steamed noodles (£3.50) that had been tossed in soy and packed with bean sprouts and spring onions for extra crunch. They were, no joke, incredible, and the perfect companion for my crispy belly pork. Oh and that pork! 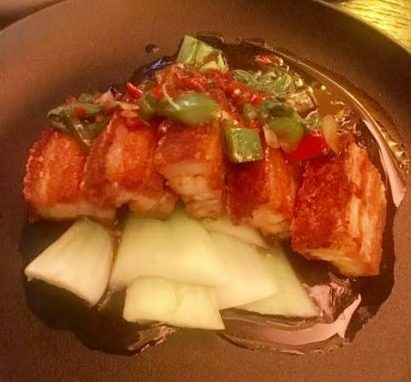 Succulent meat beneath a crispy veneer of crackling, served with fresh chillies, aromatic Thai basil and seared pak choi. I’m a big fan of this dish, and considering the fact it’s less than £13 for such a spectacular main course, it’s excellent value. 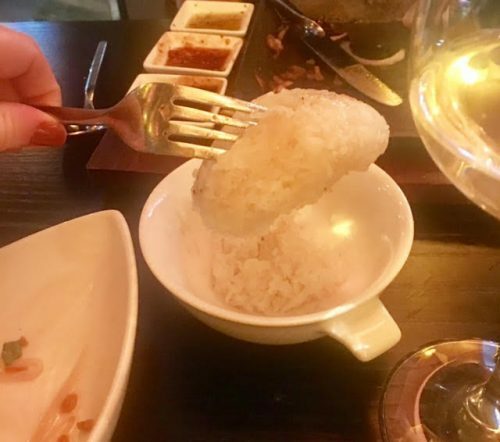 My boyfriend chose the highly-acclaimed Weeping Tiger Sirloin Steak (£19), cooked medium, with a side of sticky rice. 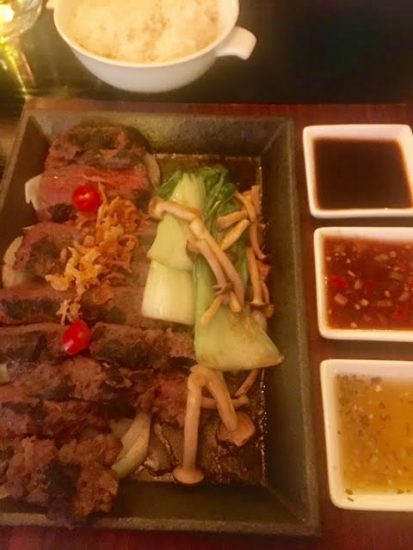 The dish comes with a trio of dipping sauces and is served with pak choi and shiitake mushrooms. The meat was cooked beautifully and seasoned well, but the rice wasn’t as positive an experience, unfortunately. That said, the beef redeemed the rice disaster thanks to its juiciness and lightly charred exterior, and the array of sauces allowed for a different taste experience with each mouthful. We decided to skip on dessert as the restaurant was getting busier as it approached 8pm and err, we had to vacate our table. I understand with busy times of year that restaurants often limit the time allowed per table, but a restaurant like Chaophraya Newcastle should be enjoyed glacially. We were very aware of the time and as it approached our deadline, there was no hint from staff that we’d be welcome to stay for more drinks or whatever, which is a shame. 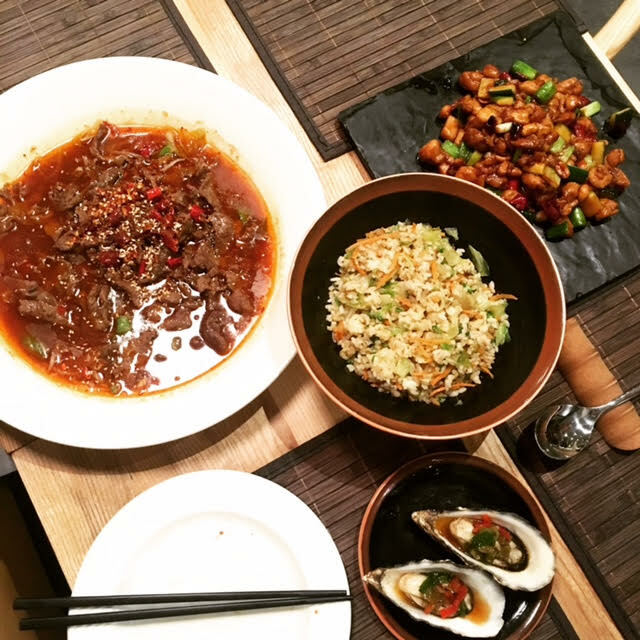 While the meal was overall delicious, our experience was a little dampened by the service. We were left alone for long periods without any member of staff checking in on us, aside from a very polite Scottish guy who was absolutely worked off his feet, however a table sat behind us was blessed with non-stop schmoozing from the staff as he was a pal of the manager. Not cool. Add that to the earlier drinks faux-pas and quite a frosty reception from the first waitress who took our order, and it’s fair to say I had anticipated more. 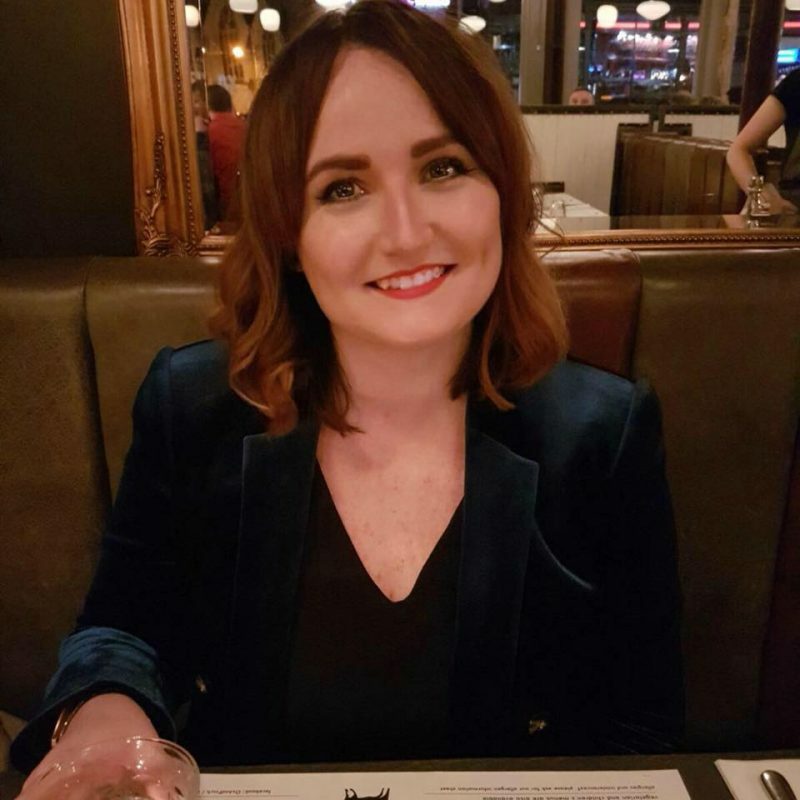 We also were told a different story about the beer situation, then overheard two different accounts to other diners about why there wasn’t any draught beer or bottles available. Come up with one excuse and stick to it. 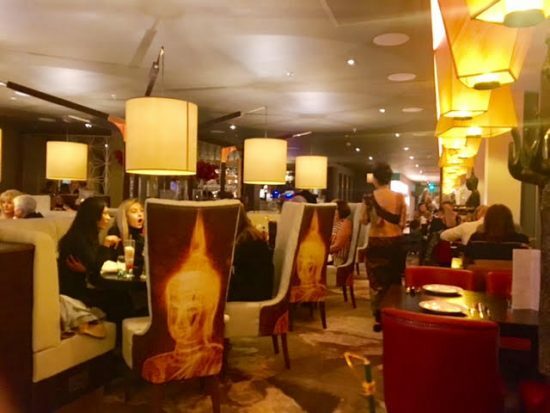 These few niggling service hiccups somewhat counteract the aim of the restaurant owners to bring authentic Thai hospitality to UK diners, so I hope Chaophraya Newcastle can step up in that department. In summary, I’d say our experience was around a 7/10. Not terrible, but it could have – should have – been better. Food, for the most part was good, drinks, when we could get them, were also decent, but the service let down the experience and we’d perhaps be hesitant to go back when there’s the likes of The Old Siam who frankly can’t do enough to make your Thai dining experience as memorable and enjoyable as possible. Hopefully, though, it’s just teething problems after opening, so if we do happen to return, I shall report back. Chaophraya Newcastle, 15, Eldon Square (Grey’s Quarter), Newcastle upon Tyne, NE1 7RA. For more information, booking and to view their menu, check out their website. The cost of our food was covered by the restaurant/PR, however we paid for all drinks. As ever, all opinions in this review are true to experience, irrespective of what we paid for. Thanks to the team at Chaophraya Newcastle for inviting us down.